As any of you who visit my Face Book page will know, I’ve been doing some more drawing this last week. 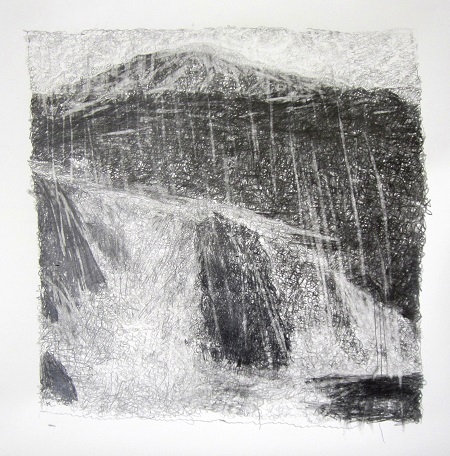 The drawing, to be titled, ‘Rock, snow and water, Harris, May 2013’ is small than the last few pieces and is square as opposed to rectangular. I wanted it to be similar in size to the 80 x 80 cm paintings I do and so cut the paper to this size. As you know though, I do like my drawings to have a rough edge and so the actual image size on the paper is 70 x 70 cm, ….give or take few millimetres, leaving a white border all around.. When we were over on Harris last month we had, to our surprise, one day of heavy sleet and snow. The following day we did a great little walk through a glen between the hills. The snow was really quite low on the hillsides …less the 100 m and after a few kilometres the path reached a bealach at about 130m. Even at this height there were several centimetres of snow on the ground and everything looked quite wild and wintry. By this time though, it was thawing and the streams were really full, cascading down their rocky beds in a mass of white water and it struck me how similar it looked to the patterns made by the snow lying on the rocky hillsides above. We spent a long time wondering and looking and I decided that I’d have to do some drawings based on this scene and idea. ‘Rock, snow and water, Harris, May 2013’ is my first attempt and I’m already working on a second piece that will be more abstract, more about the patterns of marks. Anyway, this first piece is finished I think and I’ve decided that it might be fun to enter it for the forth-coming North Ayrshire Open Art Exhibition. As you can enter up to two pieces, I’ve decided that I might as well enter one of the other recent graphite drawings too. Of course, the next step is to decide quite how to have them framed. I normally use a distressed ‘York’ silver frame with a simple mount behind glass, for my smaller paintings and I had at first thought I do with this. However, I wasn’t sure whether the silver would work with these quite stark graphite images and so went to my framer at the Waverley Gallery in Prestwick seeking some advice and ideas. I’ve always found selecting a frame very difficult and so to be honest I wasn’t looking forward to this part of the business. Amazingly though, Tim had the perfect solution …a very simple charcoal coloured frame. The moment he put it down against the drawing I knew this was the one and although we tried several other options we came back to this first choice. 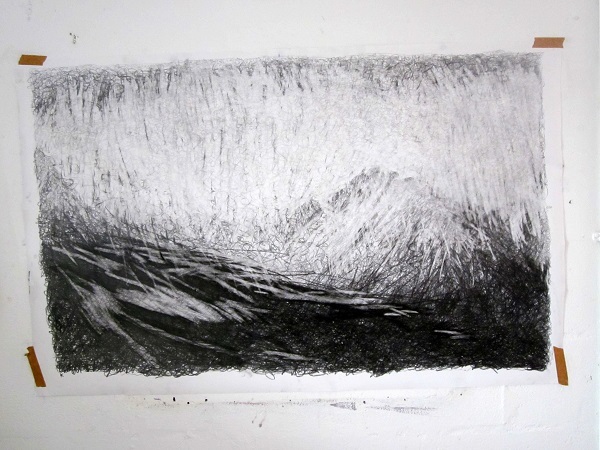 To retain the ‘rough’ edge of the drawing, there will be no mount, just the glass sitting directly onto the paper. I’m quite excited and am looking forward to seeing the pieces framed in this way especially as the second piece I’ve chosen is one of the large Glen Rosa drawings. Well then, that’s about it for this week. Nita and I are finally starting to get over the nasty bug we’ve had although my voice is still very rough. Needless to say there have been a few jokes down at the studios about my needing to take up singing the blues instead of painting! Of course though, we haven’t been out walking for over three weeks now and have been missing all the fine weather which has been most annoying and now that we’re starting to plan our next outing ….the rain is back on! Hopefully by next week we’ll have made it out onto a hill and my next blog can include a few nice photos of the Scottish Highlands.